How do I even start to cover my biggest topic — the one which has covered me for so long? 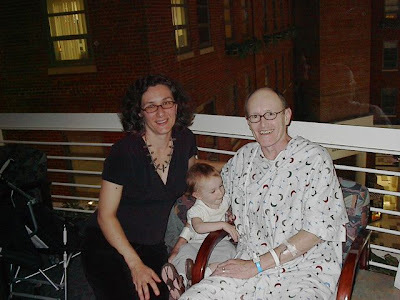 The subject of dozens of blog posts: the relationship my late husband and I shared with Death. Cancer was the horse it rode in on, but cancer was easy. You can fight fight fight! There is research! There are communities. It’s engrossing, engaging, and encouraging. I can’t tell you anything about that that you haven’t already heard. What I can tell you is, the most important thing I ever told my husband. After, of course, I love you. Gavin spent his four last days in hospice. He had been living with a terminal diagnosis nearly two years; he’d survived two brutal surgeries, including one which failed, and five (I have to write them down to be sure) drug therapies: injections, infusions, pills, pills, and more pills. The last two were the two latest possible, delivered in his last six months, at the cutting edge of treatments and not even on the market yet. (We were familiar with the code names for all the investigational drugs in all the pipelines). And he was getting an increasing number of what are humanely called “opportunistic infections” but would be called demons in earlier days: shingles. Candida. Pneumonia. An unspecified bacterial infection. An unknown fungal infection. To paraphrase D00ce, that all sucked, and we had a kid in diapers at the time. We never went to bed angry, but we had a lot of really bad days. Every day we said “I love you.” That was easy and it was important. But the third day in hospice they told me: You have to tell him he can leave if he needs to. Did I tell him? I don’t remember. I regarded it as a duty to tell the quiet parade of his closest and oldest friends visiting: Before you go in there, I have to tell you: please tell him you’ll take care of me and my daughter. Please tell him he can leave if he needs to. Those were the hardest words I ever had to say. I said them over and over. It was almost as if I was hearing it, too… the repetition helped. We’d entered hospice saying “this is to rebuild your strength.” I hoped he’d recover enough that they’d let me take him home and I’d have lots of help and he could die, surrounded by his adoring family, in a bed in our living room. You know, a month or three later. After his birthday party, after fair goodbyes, after making peace and in a state of blissful acceptance. Instead he died two days later, in a bed in that same hospice, surrounded by his adoring family and a few friends and a miniature schnauzer-dachsund mix. “The end” had been so far away for so long…. We danced with it. I asked a close girlfriend if it seemed, when she visited during a very, very bad period, that we were ignoring death, like an elephant in the room. She said, No, it was more like a kitten in the room, and every now and then one of you would lean over and pet it to pay some attention. You couldn’t ignore it, but you didn’t seem afraid, and it wasn’t that large. We never said goodbye. That was hard. Not that I felt it until later… there was no question he was “gone”… but it’s a romance that’s unavoidable, and it stung only as I hit everyone else’s expectations of what “the end” might be like, repeatedly, in the months and years following. But small stings, nothing like those we endured when we were losing our fight against cancer. When you’re still fighting, you want to know the names of that bacteria and that fungus. When the doctors tell you it doesn’t matter, you begin to hear it: this is the end. Don’t get me wrong… this is not about Elizabeth Kubler Ross and the Five Stages of Dying (not "of Grief"… but that’s another post). But I wish we’d accepted that death wasn’t a kitten any more. I wish we’d let hospice in sooner. We thought we would… when it was “time.” We had talked about hospice, earlier in his illness. We loved the idea of a “good death.” But doesn’t everyone just want to live just so, so much more? But the closer that “time” got, the deafer we became to its knocking. Who could live with that sound? We turned the Baby Einstein videos up louder. We stopped asking Dr. Google about symptoms. We got mad at the oncologist. Now that I know hundreds of people widowed after long illnesses, I know that the elements of my story are ridiculously common. Pretty much every single one except the exact details, the dates, the drug names. But the deep ones: the hard ones, the emotional scars and fights and invisible enemies. The damage done, not by not knowing (because there’s nothing we can do about that except yell at God and doctors), but by not talking and not accepting the oncoming end. Cancer may be a battle, but life is not. Life is to be lived and for love, and that is hard to really embrace during wartime. By the time he died, it wasn’t cancer any more. It was pneumonia and our unnamed bacterial and fungal enemies, and organs breaking down, one by one. At any rate, our oncologist had signed off long before: that’s a sign. That’s what I hear when I hear about fighting cancer on the internet. That’s what I flash back to when I know a cancer blogger gets an opportunistic infection. That’s what it was like, and I can remember the detail and the complexity, the numbness and intensity intermingled, when one of my closest friends tells me that her close friend’s family won’t talk about what’s next when her lungs are filling up with fluid. Not quite triggers… memories of deep and dark times, and I feel huge lightness after finally sharing my side of my part of the story. That’s how much is still in my brain and body and heart seven years after diagnosis, five years after his death. And oh, how I wish I could change it for every single person reading this. so hard to read of others' pain. My dear husband of 57 years died of surgical complications on August 31, 2016 and my darling Jennifer died 10 days later in City of Hope from pneumonia after fighting acute myeloid leukemia for only 7 months. My heart is so full of sadness right now after a lovely Christmas last night with all my family and friends. Now another brunch tomorrow and I don't know if I can do it. Everyone is trying so hard to comfort me and I am trying so hard to be strong! I have deep faith and know Jennifer and Rich are together, but they are not with me! Thank you for providing a place for me just to let it all hang out Will the pain ever end?!!!! Thank you for writing this. My wife died from cancer after 4 years of much of what you described. And I think we treated death in the same way. I don't really know how to do that differently as long as we think there's a "chance". Coming to grips with, as Dr. King said, "the reality of the inevitability of death" is as old as life itself. The one thing I am grateful for...and it is enormous...is that I did have the chance to hold her, tell her to "let go" and have her die in my embrace. She was out of it, but I like to think she heard me, and that she knew she could leave me in peaceful acknowledgement that I would make it. I will be forever grateful to her and I will honor her for the way she lived...and the way she died. I wish us all peace. Thanks, friends... it is still gratifying to feel like I wasn't alone during those days, even though I felt I was... to come here at this late date and find out how many of you had similar times and feelings... is still a very powerful thing. Thank you! thank you Robin--for putting words to those final months-weeks-days of fighting, of not giving up until the very end. Of being SO glad Keith could make the 4 hour trip home so he could see our home and his friends after 10 weeks inside an isolation room at Stanford. Hear the birds sing, pet the cat, wake up in his own bed. The awful knowledge that he was facing a future alone, that I was facing a future without him. He was not afraid, yet I was. The fear that turns your stomach and hurts your teeth. He drifted away slowly, 10 days after he came home, at night, with me by his side falling sleep out of pure exhaustion. We'd said our goodbyes but I long to have said I love you, wait for me, one more time. Dianne, I don't think you should worry. While these are vivid memories, the injustice, the sadness, the rage is mostly gone. It's not part of grief... It's part of a story that comes up only when I feel I could help someone... That gives it urgency. This post has been provoked by a blogging friend (acquaintance really) who has been "fighting" way past the point when I thought the fight was over for her. The thoughts don't haunt me and I hope they aren't holding me back. Yes, it's a long journey... But it gets better. Much better. Over and over again, and even as we leave parts of our history behind, we store some, and other bits stay but so deep they only come out when poked hard (as this was). Even so, it only "held" me while I was writing... a few hours. And writing it was better than the feelings I got from "watching" this patient's progress without the ability to do anything. Life goes on, and forward, only forward. Wow- this struck a chord with me as well. I echo so many of your sentiments. We fought so hard against cancer and had so many close calls along the way, that I didn't seem to recognize his decline when it was staring me in the face. I tried to be so strong and positive for my husband, but maybe that was just denial? Patrick battled cancer on and off for a year and a half. The time was filled with surgeries, infection, chemo, radiation, hope, clear scans, unclear results, disappointment, good days, bad days, arguments, exhaustion, denial, disbelief, laughter, soul-searching and the list goes on and on. Throughout it all was our love and I am so thankful for that. After almost 2 weeks between the ICU and the Oncology inpatient pavilion, his oncologists finally told him on Friday, Jan 6th, 2012 that they recommend he go hospice and spend the rest of his time with family/friends. They said he only had a few weeks left. He started pulling people aside one by one and telling them how he felt about them while he was still in the hospital. I made plans to get him to a nice new hospice for Saturday. We talked that night and he was scared. When he woke on Saturday morning, something had changed. He asked me to come sit with him and he said "I think tomorrow is the day" and he wasn't scared anymore. He was at peace with everything despite his breathing getting harder everyday. He asked me if I needed him to wait a few more days and I said "I want you for as much time as I can but I don't want you to be in pain. If you are suffering, then you need to go." Just thinking of that conversation gives me peace and pain simultaneously. I must have been in denial because I could not believe he would be gone on Sunday. I thought he was wrong, although thankfully I never said that to him. I kept focusing on just getting him to hospice and that was the singular thing keeping me going that day. I told family and friends that he thought "tomorrow was the day" but even though I said the words, I don't think that I even digested those words myself. We got him over to hospice by 3 pm on Saturday. After spending every night in the hospital, I took a shower in his room. I hate that I spent that time just taking care of myself. His priest came over at 6 pm and prayed with all of us. My family brought our dog by to see him at 8 pm and then some friends stopped by. Around 10 pm on Saturday, he said it was time. I called everyone back to the hospice in a fog. He was surrounded by 20 people who loved him by 11 pm on Saturday night. He felt that he was "going out on his terms" and he was even cracking jokes in his final hours. My wonderful husband was gone by 3:15 am on Sunday. He was himself to the very end and I am so thankful for that. Somehow he knew that Sunday was the day, even when doctors and all of us thought he had at least a few weeks left. That night was beautiful and traumatic. It was the worst night of my life but I am also comforted by the fact that he "went out on his own terms" after having so little control in his fight with cancer. I like to think it was divine intervention that comforted him and gave him peace on Saturday through the wee hours of Sunday. I don't even know how to describe that night to people who were not there. Such a strange mixture of shock, peace, love and horror. It was so hard sharing those final hours with 19 other people but I am also thankful for it. Those 19 other people share the grief with me now. They help me reflect on the beauty and bleakness of that night. Now I am here on this board and taking comfort in the words of other strangers because they understand. Thank you for sharing your story. Thank you for writing this, Dave and I never talked about his death and so much went un said, I wish to god that we had talked about his dying, what you wrote makes me feel better about it, I know now that I am not the only one that feels this way, his death was so horendous that I can't even remember if I told him I loved him before he died, I am only 12 weeks into this damd club they call widowhood so everything is still very raw. I've told you many times how much this site has helped me during the past year, Robin. You have my heartfelt thanks for creating this very special place. And I'm so grateful that you are feeling some relief after sharing your story. It struck so many chords with me. Vern also spent his last 4 days in hospice, after a long, very hard cancer battle. Multiple surgeries, paralysis, rehab, infections, infections and more infections, c-diff, MRSA, sepsis, pneumonia, pleural effusions, open wounds, radiation, chemo, countless blood transfusions, an abdominal aortic aneurysm, kidney failure, dialysis. But through it all there was always hope - always. We were told at diagnosis they hoped treatment could give us maybe 2 years and we got 4.5 in spite of the many crises he experienced along the way. He didn't want to know any of the specifics about his disease. He trusted me. I did the research, I asked the questions. 'Never give up' was our motto. And then there was that final hospitalization. The cancer had spread, no more treatment, no more dialysis, transfer to hospice. Time was very short. And yet even then I didn't really talk to him about dying. I talked to him nearly non-stop during those 4 days, but my words were those of love and memories of our 41 years together. He wasn't able to speak much, only a few very precious words of love. I couldn't waste time with talk of dying. It's been 16 months and yet those "memories of deep and dark times" keep returning to me. I second-guess whether I did everything right. And unlike Abby, I do not find comfort that this could go on for years to come. I must admit that it's rather frightening to me that you are feeling this way after remarriage and five years has passed. Thank you for sharing this with us Supa. There was no long term illness for my husband. His diagnosis and dealth happened all within 2 months. Didn't have to tell him the words it's ok to go. Didn't get the chance but knew those words were coming. Instead when I got the 1st call he was gone and he came back, I had to tell the hospital not to bring him back, to let him go. There was no hope of recovery and it seemed cruel to keep bringing him back. I knew what his wishes were and out of love for him I left him go. This is a hard journey all of us are on and thanks to you for giving us a place to come and the many people who are willing to share their experiences, it has made the journey easier and more bearable for all. Robin: I understand fully that awful fight. My husbands was with lung cancer and from diagnosis to his death was only 3 months, but we fought with everything we had. We were fortunate in the fact that when he decided he could no longer hold out hope of a cure it only took me 3 hours to get everything in place to bring him home from the hospital. We lived his last 2 weeks at home with all of our family around us. I did find the courage his last night to tell him it was ok for him to let go, even though I was screeming inside "Please don't leave me" He passed away the next day with all of us around him in the home we built together just like he wanted. I couldn't save him from that awful disease, but I would of moved heaven and earth to make sure he got to spend them where and how he wanted. It's been 8 months now but it still feels like yesterday. My love...sadness...pain and lonliness are still as strong today as the were on May 14th. But because of people like you and everyone here I believe I've come along way in my journey, I still have miles to go in the days...weeks and months ahead but thank you for getting me this far.